The Secretary General António Guterres made the current state of the struggle over gender equality clear at the 63rd session of the Commission on the Status of Women (CSW 63) – the central question that underpins gender equality is the question of power and politics. It is no surprise to us that power has always been unfairly distributed between men and women; from social norms, gender roles to basic infrastructure, we observe a wide range of barriers that impede women from breaking the glass ceiling over their heads. The World Conference on Women held in Beijing in 1995 was a hopeful start to achieve greater equality and opportunity for women, yet, twenty-four years of struggling later, women are still facing strong push-backs as inequality and violence against women and girls in the world perpetuate. Gender empowerment is not only about a mindset change or a verbal recognition of the rights of women, but the redistribution of power through the restructuring of public services and social security system from a gendered perspective. The most effective way for us to push back against the push-backs and to redefine social norms is the empowerment of women through concrete policies that can translate to tangible changes. Adopting such an action-oriented approach requires integrated efforts from all sectors in the society. 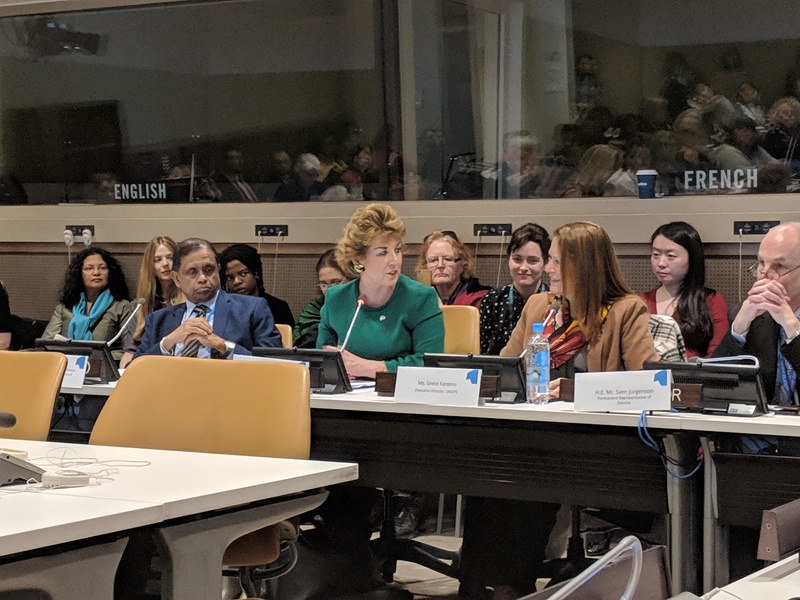 During the various side-events hosted by countries during CSW63, we observe a clear trend of increasing partnerships between governments and specialized agencies, donors, local communities, academia and the private industry. An example that illustrates the positive impacts of collaboration would be the Gender Standby Capacity Project (GenCap). GenCap is an Inter-Agency Standing Committee initiative launched in 2007 with the Office for the Coordination of Humanitarian Affairs (OCHA) and the Norwegian Refugee Council (NRC). The GenCap project aims to support the strategic and operational response of agencies in applying gender equality programming in the humanitarian response. In 2018, GenCap provided assistance to conflict-stricken areas such as Myanmar, the Democratic Republic of Congo, Afghanistan and more. 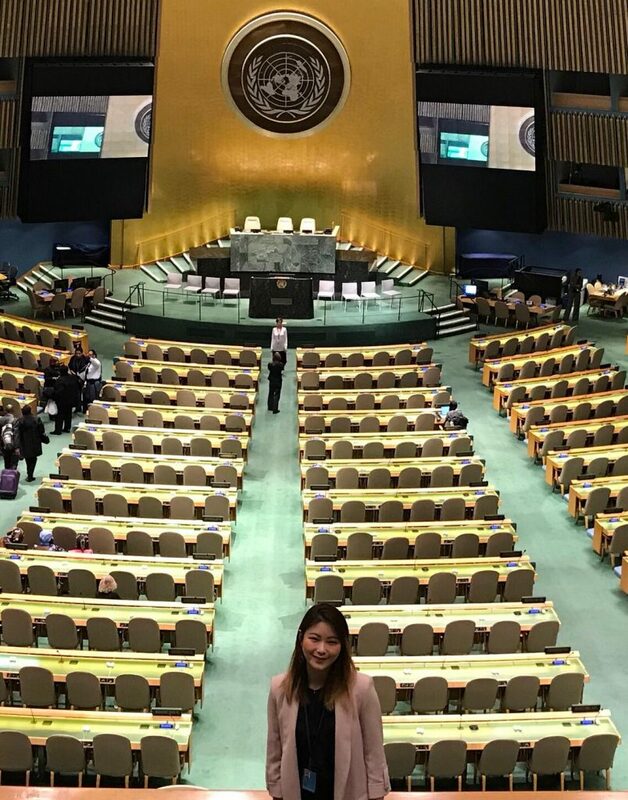 Danielle Luo arrives early to attend the opening session of the CSW 63 in the General Assembly room at the United Nations. It is truly heartening that different stakeholders are starting to work together towards the same direction to tackle the challenges faced by women and girls in need. This is where we see the value of a conference like the CSW63 – the United Nations plays a spearheading role in defining the specific goals that we want to achieve; it brings together the political and civil societies to streamline our strategies and establish strong connections; and it institutionalized the struggle for gender equality to grant the movement legitimacy and momentum. Collaboration between actors with different specialized knowledge and skills is certainly the first step to advance the empowerment of women and girls. Out of all the aforementioned partnerships above, the most fundamental one is potentially the close collaboration between governments and academia or research institutions. The generation of data through research and studies turns observations and speculations into solid facts. The lack of resources and opportunities for women will no longer be a debate when such a reality is supported by strong data. The Organisation for Economic Co-operation and Development (OECD)’s Development Assistance Committee (DAC) presented their research on bilateral allocable aid committed by DAC members in 2016-2017 and of private foundations’ financing for gender equality and women’s empowerment in 2016. The study shows that funding for dedicated programmes that target gender equality and women’s empowerment as a principle objective remains low at 4%, and 62% of aid remains gender blind. The findings of this study can serve as a valuable guide for future designation of funding. Clearly, data and statistics are the building-blocks of the struggle for gender equality, as they pinpoint to the specific actions that should be taken to narrow the gender gaps demonstrated by the data. Conclusions drawn from data analysis can then substantively inspire appropriate policies. No social movement can create palpable changes without the implementation of meaningful policies. The ultimate goal defined by this year’s CSW – women’s access to public services and social protection system, cannot happen in vacuum without any support from concrete policies. Governments around the world have to recognize that they have the capacity to elevate the status of women by guaranteeing access to basic health services, education, clean water, safe transport, energy, pensions, parental leave and more. Only through progressive policy changes can we break down the barriers that impede women from achieving parity with their male counterparts. It is also critical for us to recognize that the entire process above should not limit itself to a binary approach. Instead, intersectionality should be at the forefront of all considerations pertaining the challenges faced by women and girls. The needs of indigenous women and women with disabilities should be honoured as we adopt an all-inclusive approach that leaves no woman behind.